Our #1 Best-Selling HERO Product – Bundle and Save! We are currently awaiting our next delivery of Turmeric capsules which has been delayed due to the Easter break. All orders containing Turmeric Capsules will be dispatched on Wednesday the 1st of May. Sorry for any inconvenience this may cause. With easy-to-take Nature’s Help Organic Turmeric Capsules you can start getting the benefits of Turmeric today. I first heard of this product in the video series “Truth About Cancer” in the summer of 2015. We ordered our first shipment shortly after and I wouldn’t be without it. I had a blood draw a year later that showed no inflammation, for [then] 62 years old, my naturopath was really surprised. Before using, I had some natural aches and pains. I truthfully have no aches, and attribute it to this particular product. In almost four years, I have had one hiccup in delivery, and it was immediately remedied. Considering this company and I are in two different continents, I am so impressed and appreciative of not only the quality of product, but the fabulous folks you have on staff Sorry this is review is so long. Hi Pam, never be sorry for leaving a long review 🙂 As a small team we strive to exceed when it comes to customer service, so reading your review only puts a smile on the faces of the team here at T.A. Thank you for taking the time to share your experience with us it is greatly appreciated. Great Product. Stopped me from getting Cramps in my legs most nights. Good to hear! Night cramps or Restless leg syndrome is horrible. I have been buying this product for a few years now. Since using it the arthritis in my knees is so much more manageable and I rarely need to take prescribed anti inflammatorys. On the rare occasion that I have run out of my Tumeric capsules it only takes a few days for my knees to tell me to start taking them again. I also found that they reduced my hay fever symptoms too. I highly recommend this product. Hi Joy, inflammation in the knees is incredibly and we are so pleased to hear that the turmeric capsules were able to help you. Thank you for sharing. I have been using this product for some time now. When my inflammation ramps up, so does my turmeric intake with good results. Soon as I feel pain I head to my turmeric supply. Hi Val, thank you for writing your review and mentioning the part about allergies. We have been hearing this a little more frequently of late so it is good to see it in writing. Thanks very much, and have a nice day. 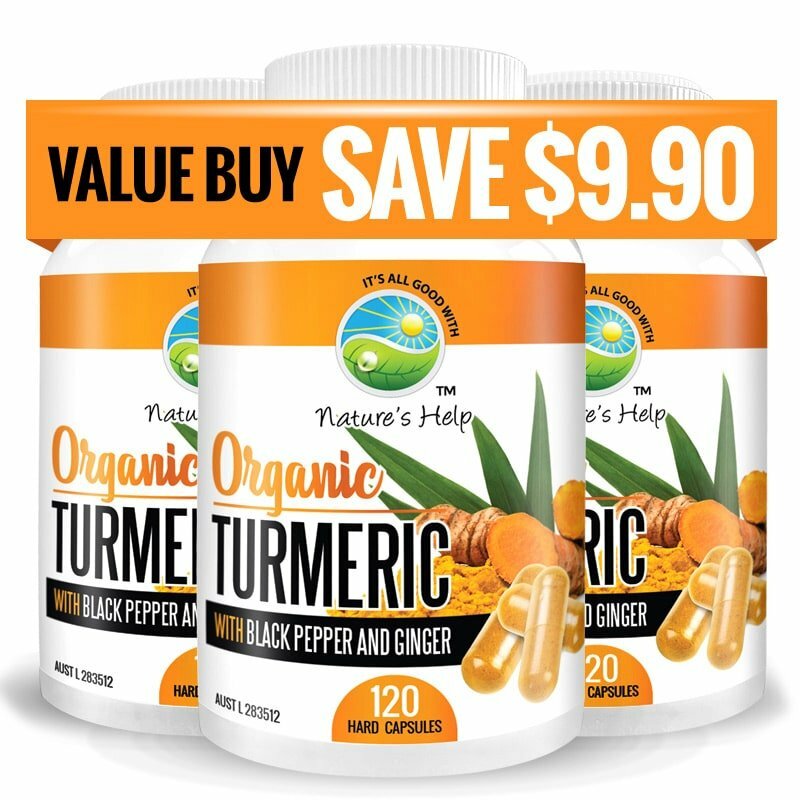 The quality of this product along with the addition of ginger and black pepper make this combination of turmeric very effective. I use it for inflammation and joints pain but also for the brain functions and memory and finding it very helpful. I’m considering doubling the dosage for even better results. Hi Kate, many of our customers use turmeric for inflammation and joint pain with great results. We are pleased to hear you are another happy customer. Thank you for taking the time to comment. I do believe Tumeric has helped me immensley. I feel my body has more energy now I am taking these products to improve my health. weekend away as they are easy to pack & won’t spill like the bottle ones. I am very pleased with your products & would recommend them to anyone. Delivery is very quick, I was so surprised to get my order so quick. Customer Service is really helpful & operator’s are very helpful & pleasant. Capsules are vegetable cellulose origin and are suitable for vegetarians and vegans. Take two capsules twice daily with food or as directed by your healthcare professional. Four capsules per day is equivalent to consuming one teaspoon of turmeric. Keep out of reach of children, do not use if the seal is broken, store below 30ºC. •	Due to Turmeric’s anti-coagulant properties, it is advised to stop using 2 weeks scheduled surgery. •	Turmeric should not be taking other alongside blood-thinning medications without the permission of health practitioner •	If you are taking blood pressure medication, please consult your healthcare professional before taking Turmeric •	Always read the label and use as directed, supplementary to a balanced diet. •	Or as directed by a healthcare professional. •	Keep out of reach of children.